Happy birthday Elizabeth K. Cooper (And Everything Nice: The Story of Sugar, Spice and Flavoring), Nancy Ekholm Burkert (Snow White and the Seven Dwarfs). In 1959, Fidel Castro becomes premier of Cuba. Read The Red Umbrella by Christina Diaz Gonzales, Flight to Freedom by Ana Veciana-Suarez, and My Havana: Memories of a Cuban Boyhood by Rosemary Wells and Secundino Fernandez, illustrated by Peter Ferguson. It’s Pancake Day. Read If You Give a Pig a Pancake by Laura Numeroff, illustrated by Felicia Bond, Pancakes for Breakfast by Tomie dePaola, Pancakes, Pancakes by Eric Carle, The Dancing Pancake by Eileen Spinelli, illustrated by Joanne Lew-Vriehoff. February has been designated National Children’s Dental Health Month—to increase awareness and stress the importance of regular dental care. 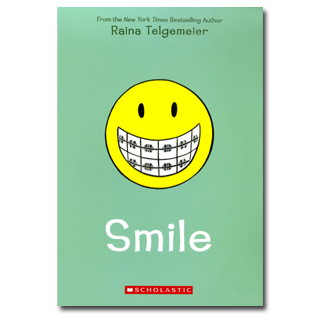 In 2010 New York Times bestselling author Raina Telgemeier published a graphic memoir, ideal for ten- to fourteen-year olds called Smile. 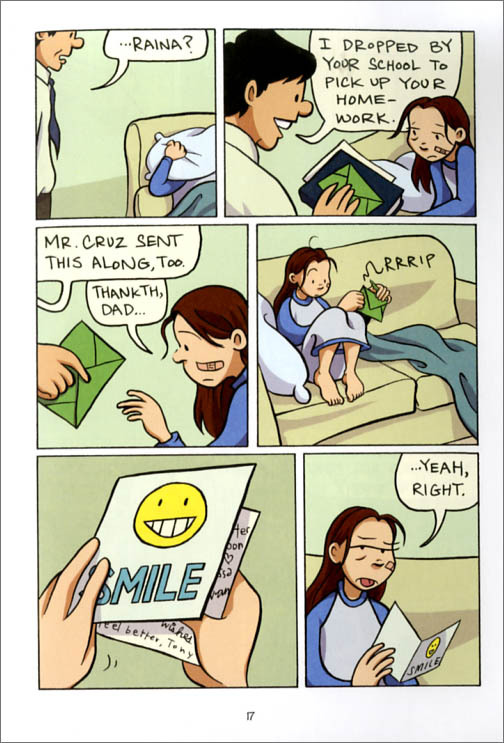 In 214 pages Telgemeier presents the struggles of her protagonist, Raina, who has two front teeth knocked out in sixth grade. This means lots of time at the dentist, undergoing a variety of procedures and problems—in total, four and a half years of treatment. Few writers have given better advice to young readers. Because Raina uses the most popular format of the day, the graphic novel, to tell this story, she has already won over her audience by the time she delivers these lines. Readers come to love Raina, cheer her along, and even learn a great deal about what happens in the dentist chair and what various dental procedures entail. For anyone who has had to undergo extensive dental work, whether braces or reconstructive surgery, this book is almost a necessity. Since publication, Smile has been wildly popular with young readers. John Schumacher, Librarian at the Brook Forest Elementary School in Oak Brook, Illinois, witnessed a fifth grader put the book in a friend’s hand, guide her to the circulation desk, and say, “You must check this out now and tell me your thoughts in the morning!” An interactive website has also been widely used by fifth and sixth graders. Some read Smile as a memoir; others simply find themselves fascinated by a story that rings so true to their own experiences. Outside of being easy to comprehend and a very fresh and honest look at common dilemmas among children and teens, Smile has been created by someone who remembers, in exacting detail, the concerns of fifth through eighth graders. In the end, whether you are an adult or child, after finishing this book you will find yourself smiling along with the protagonist. Originally posted February 16, 2011. Updated for . For pancake day, I also like HEY, PANCAKES! by Tamson Weston and Stephen Gammell. I love this cover! I remember how its simplicity and bright colors caught my attention the first time I saw the book, and it certainly invites readers into the story. This graphic novel deserves praise for its ability to transport me back to my younger self, complete with the braces and self-doubt that were firmly wedged into my teenage self. I must share a secret: my little brother, a very hush-hush Raina Telgemeier fan, was caught reading this book after a particularly agonizing round of orthodontia. Thank god for households with older sisters, otherwise I fear this book would have never made it into his hands. I attended a session with Raina about how she developed the book at Horn Book at Simmons in 2010. It was so fun to hear from her about her experience and how she rendered it into graphic form. Not usually a fan of graphic novels, this one drew me right in and held me the entire time. So pleased she won the award and hopeful she’ll produce other books! I read this after the review last year. I had considered myself fairly well informed about dental health but I was really surprised by the new thingsI I learned reading this book. Great book for parents and child. I’m a new fan of graphic novels and I look forward to reading this. Raina Telgemeier’s Babysitters Club books were the first graphic novels I ever read. I bought my copy of Smile at the in 2011 and had Raina sign it for me. I read it in one sitting. I think my favorite illustration is the one in which she watches The Little Mermaid for the first time in the theater. Her immediate response to it mirrors my own. I’m a big fan of graphic novels (I loved and continue to love manga books). Smile is wonderful. It reminds me of my own battle with braces (I had four teeth pulled, a palette expander, headgear, and on again/off again braces). I can relate and most of all, I can sympathize. From someone who has had braces twice for a total of 6 years as well as other dental-related surgeries, I wish this book was around when I was younger! Such a relatable book…never have enough copies in our store.